Sansha city in South China's Hainan province, the country's southernmost city, has banned fishing and tourism in and around the world's deepest blue hole as part of its efforts to protect the maritime environment in the South China Sea. Organizations and individuals are forbidden from the activities in Longdong－known as "Dragon Hole"－or within 1 nautical mile of the blue hole, according to a notice issued by the management committee of the Yongle Islands in Sansha. Other activities concerning the blue hole, such as scientific expeditions and environmental protection programs must be approved by the government, according to the notice. The blue hole, a major coral reef, is more than 300 meters deep and deemed the deepest of its kind in the world. Blue holes are underwater sinkholes that appear darker blue in color the deeper the water inside gets. The notice on the Sansha government's website on Saturday is intended to help protect the blue hole and its neighboring coral reef ecosystem. The diameter of the sinkhole's top entrance measures about 130 meters; and the bottom measures 36 meters, according to Track Ocean, a private research organization whose research institute probed the sinkhole several times between August last year and June this year. 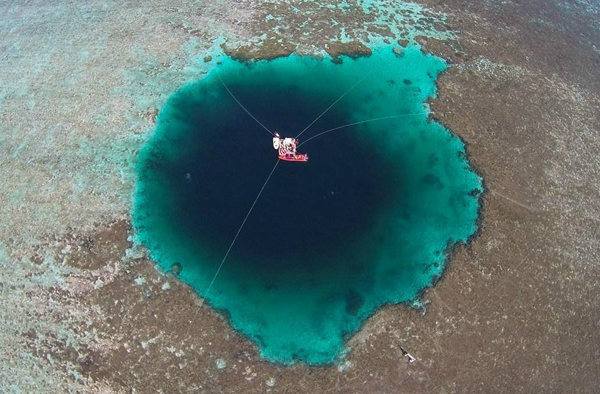 Yang Zuosheng, a professor at Ocean University of China in Qingdao, Shandong province, said the sinkhole, which is about 100 meters deeper than Dean's Blue Hole in the Bahamas, is of significant scientific value. According to Yang, the coral reef in the 300-meter-deep formation contains crucial information, accumulated over tens of thousands of years, that researchers can study to discover how changes in global climate and sea level affect the environment of the local waters. A research program on the sinkhole was the first project to gain support from Sansha's special fund for maritime ecological protection, according to Hainan Daily. The Yongle Islands are part of the Xisha Islands. In July 2013, the Sansha government set up a management committee to administer the islands and their surrounding waters. Guo Yong, deputy director of the committee, said the notice, which was issued on July 28, shows the importance Sansha attaches to the maritime environment. To restore the diversity of ocean life, the committee has invested more than 20 million yuan ($3 million) and has released various species of young fish and sea cucumbers around the reef, Guo said.